I see that Son of Saul, the Hungarian film about a Jewish slave worker in Auschwitz is about to be released in the UK. I’m sure it will be a gruelling experience, but I am looking forward to seeing the film. This film is fictional, but my book I Survived a Secret Nazi Extermination Camp contains the real story of a Jewish slave worker in Belzec, one of the Operation Reinhard extermination factories. Rudolf Reder was the only post-war survivor of this hell hole, where 650,000 Jews and Gypsies were murdered. In 1946 he gave an account of his experiences to a Jewish Historical Commission which was gathering testimonies for use in future war crimes trials of the Nazis. Reder’s witness statement, which runs to 40 pages, is a highly detailed, graphic and horrific account of what he saw and experienced. It is not easy to read the painful incidents that he recounts. When people ask me if I plan to make a film of the book, my response is that if the story were told truthfully, it would be the most painful horror film which would force all viewers to avert their eyes. So I am interested to see how the director in Son of Saul manages to show the unbelievable cruelties that occurred in Auschwitz to innocent men, women and children. It was March 1942. The Second World War had been going on for already twoand a half years. Across Europe, there had been a continual rounding-up of communists, gypsies, Jews, homosexuals and other so-called ‘undesirables’ for even longer. The term ‘concentration camp’ had become a byword for the ruthless efficiency of the German Nazi machine. But nothing could have prepared the world for the process that was about to get underway in South-East Poland. The concentration camp at Belzec was to become the very first Nazi death camp. This was the world that Rudolf Reder, a Polish Jew from the nearby town of Lvov, found himself thrust into. I Survived a Secret Nazi Extermination Camp is the harrowing and extraordinary story of the extermination camp at Belzec, Poland. Belzec is not an instantly recognisable name like Auschwitz or Dachau, and yet some 650,000 Jews and gypsies perished there in just a few months. One man, however – Rudolf Reder – escaped from Belzec and gave an account of the camp. Mark Forstater has tracked it down and it is the centrepiece of his book, a detailed and horrifying description of a truly dark death machine. I Survived a Secret Nazi Extermination Camp presents Reder’s account of everyday life and death in Belzec and his miraculous escape. Forstater explains how he found the story, why it matters – and why it matters to him. Nearly every Jew and gypsy who ended up in Belzec died in the gas chambers within two hours of their arrival. Reder managed to survive for four months for an ironic and macabre reason.He was an engineer and useful to the Nazis in and around the camp. Moreover, he was the only man with the skills needed to repair the tank engine which produced the lethal carbon monoxide gas that was responsible for the brutal deaths of so many. After four months of incarceration Reder was taken to visit his home town of Lvov nearby to collect spare parts for the camp. Fortuitously, three of his guards went for a drink and the fourth fell asleep in the truck. Reder seized his opportunity to escape and was hidden by his former housekeeper who he eventually went on to marry. Mark Forstater introduces Reder’s account and adds a personal memoir. He tells how he learned about the Holocaust growing up in America and how, in his search for his Grandfather’s roots in Poland, he discovered Reder’s witness statement and through it the fate of his own long lost relatives. 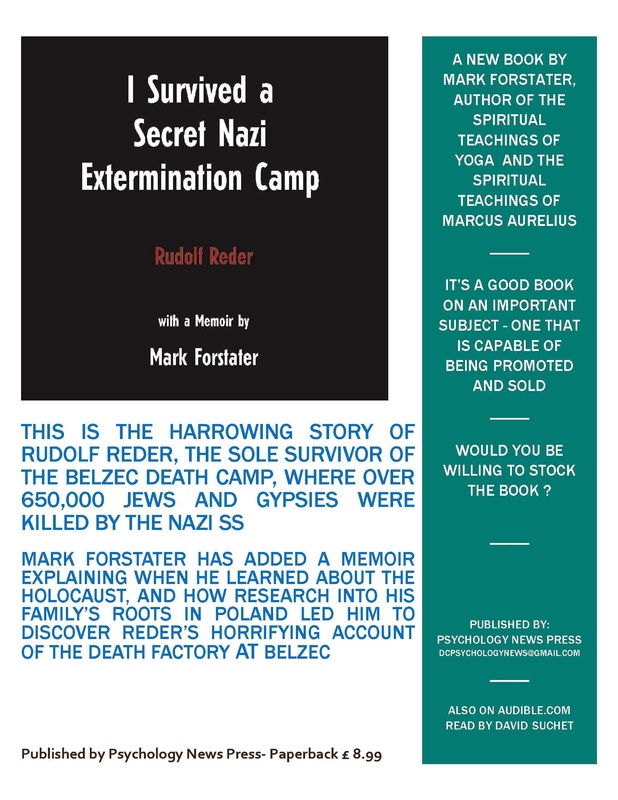 With comparatively little known about Belzec, unlike the other two death camps in Eastern Poland at Sobibor and Treblinka, but with the enormity of the crimes committed there in mind, Forstater increasingly believed that Rudolf Reder’s story, harrowing though it is, should be heard in the outside world. And his own heart-rending reflections, brought to life in his engaging and poignant memoir, go a long way to helping square the circle and humanise what is a story of dehumanisation. I Survived a Secret Nazi Extermination Camp is an important addition to the literature of the Holocaust. Mark Forstater is best known for his work as a film producer on some thirty films, including Monty Python and the Holy Grail. He is also an author, having published books on philosophy and spirituality that include The Spiritual Teachings of Yoga, The Spiritual Teachings of Marcus Aurelius, The Spiritual Teachings of the Tao, The Spiritual Teachings of Seneca and The Living Wisdom of Socrates. An American originally from Philadelphia, Mark lives in London. He has been married twice, has four daughters and three grandsons. I Survived a Secret Nazi Extermination Camp is published by Psychology News Press and is available at £8.99 from reputable bookshops, online at http://www.amazon.co.uk , from the dedicated website http://www.isurvived.org.uk/ or direct from the publisher at http://www.psychologynews.org.uk . Writer-director David Cohen and I (with the massive help of Richard Cobelli) have just launched an Indiegogo page to help fund The Escape Of Sigmund Freud. We uploaded two videos- the first a pitch video in which David and I sat in his conservatory and talked about the film and how much we wanted to raise (£ 300,000 out of a million pound budget), and the second a short teaser trailer in which actor John Kay Steel plays Anton Sauerwald, the Nazi who was meant to make Freud’s life hell, and instead helped him to escape Vienna. It’s a remarkable true story, and we feel very good about it. We have a solid script and the excellent David Suchet to play Freud. We hope to cast other fine British actors (and one German to play Sauerwald). Shooting will take place in London, Poland and Vienna in the early part of 2015. I believe that the film has the potential to be a very powerful story about the Shoah (the holocaust). It’s an unusual story in that the ‘good Nazi’ who helped the Freuds was in fact a dedicated follower of Hitler. He was not putting on his belief in the Nazi regime and the Fuhrer, but believed deeply in the Nazi ideology, This is what makes the story so fascinating. Why did this deep-dyed Nazi go out of his way (and in fact risk his career and life) to help the Freuds? He couldn’t explain his actions, and what is even more telling, Freud himself had no idea why he did it. This is the mystery at the heart of the film. A strange friendship grew up between these two unlikely buddies. What always astounds me is the fact that Sauerwald made a trip to London in 1939, just before the war broke out, to see how Freud was settling in, and to check that all the art works he had helped pack and ship actually arrived in good condition. On this occasion Freud was recovering from an operation for cancer of the jaw (an illness he had for many years) and he asked Sauerwald if he would drive Freud’s Viennese surgeon to London to do a remedial operation. And he did. Please take a few moments to visit the Indiegogo site, and if you would like to see this film come into existence, then make a contribution – big or small – and help us to get it made. Whether you contribute or not, could you take 5 minutes and share the information with anyone who you think would find it of interest. I’m preparing a new film which tells the story of how the world-famous creator of psychoanalysis managed to leave Nazi-occupied Vienna protected and helped by the Nazi who was meant to make his life a misery. Anton Sauerwald ignored Berlin’s orders and gave Freud and his family assistance, much to their relief and amazement. This is a true story based on a book by David Cohen (The Escape Of Sigmund Freud) published in the UK, US, Japan, Brazil and other countries. Freud managed to leave Vienna with sixteen members of his family, and his overseer, Sauerwald, arranged to sell some of Freud’s art collection to pay for the extortionate exit visas. He then sent Freud’s possessions to England by lorry, and later visited him in London (1938). On that visit Freud asked Sauerwald if he could drive his Viennese surgeon to London to operate on Freud’s cancer of the jaw. But the most striking part of this strange relationship between the second most famous Jew in the world (Einstein was the first) and Sauerwald, a committed Nazi, is the fact that Sauerwald found the Freud family’s hidden foreign bank books. If his superiors knew they existed, Freud would have been immediately arrested. Sauerwald kept the bank books to himself, never reported them, and gave them back to Freud, without asking for a penny for himself. After the war Sauerwald was arrested and tried for stealing from the Freuds. He asked Anna Freud to write a letter explaining what had happened. Perhaps influenced by the fact that her four aunts (Freud’s elderly sisters) all died in concentration camps, Anna hesitated for some time before finally writing a letter which declared Sauerwald’s innocence. The events the Freud family endured are alarming and terrifying, yet strange and surprising twists of character and fate take place, leading almost to a sense of disbelief. Could this really have happened? Did a deep-dyed Nazi actually help Freud escape? Many Holocaust stories defy belief, but this one is different. It exposes the contradictory nature of the human mind, and it seems in keeping for this to happen to Freud, whose fame derived from studying the mind. David Suchet is attached to play Freud, and there are other great parts. If we succeed, The Escape of Sigmund Freud could become one of the great Shoah films of our time, showing the horrific change that fell upon the Jews of Europe once the Nazis took control of their homelands. This is a sad, terrifying and moving story, but it still has moments of dry humour, since it was Freud’s sense of gallows humour which kept him sane. Freud’s escape shows how complicated relations between Jews and Nazis could become. Who could imagine that a strange friendship like this could develop? Although Freud was world famous for understanding the human mind, he was at a loss to explain why Sauerwald helped him, and Sauerwald too could not understand it. The film will be shot largely hand-held, so that the sense of actuality will be preserved. The intention is to help the audience see the events unfolding in front of their eyes as events happening to the Freud family, and not as an ‘historical’ film. It is really an amazing story and I am looking forward to making it. When you publish a book either by yourself or with a small publisher (mine is David Cohen of Psychology News Press) you are faced with the uphill struggle of getting your book in front of people. Without a marketing and PR budget it really is a daunting task to get your book noticed. How will anyone know it exists? So we (myself, David and PR wizard Nigel Passingham) devised a plan to make the book visible. Whether we succeed or not you will be able to judge in the next few months. Ours is a slow-burn campaign, starting small and hopefully not shrinking from that point. We decided to start in the UK, where we are based, and where we hope to be able to shift the 750 paperback copies that Biddles printed for us (just before they went bust). We are starting with an email campaign which I initiated today. I used Mailchimp and sent it to the 1500 people in my address book. So far about 1/3rd opened it, and we have had 43 clicks ( I assume that means possible buyers). However a number of people complained that the image in the email was altered and some of the text garbled. Why ? I have no idea so have asked Mailchimp to explain. So I plan to send a text only email tomorrow so that at least everyone will be aware of the title of the book. There is also a very good audio of the book which I produced. It is read by David Suchet ( and moi) and is available on Audible.co.uk. This could also be a radio programme. Since I went into this project as a memorial to my grandfather, I am not expecting to make money from it. But my publisher has spent some, and I’d like to make sure he doesn’t lose out. Besides, I am very proud of the book , and know that it is a good and worthwhile read, so I have no problem in promoting it. When Did You First Learn about the Holocaust? A friend of mine read the manuscript of my new book, I Survived A Nazi Extermination Camp, and said that three things struck him most forcefully. One was the sheer grimness of Rudolf Reder’s first hand account of the death factory that was Belzec. He couldn’t understand why the Nazis felt it necessary to so degrade and dehumanise the people that they were about to kill. They planned to kill them, they knew the victims would be dead in a couple of hours, and yet they had the need to make these last hours as unpleasant and gruesome as possible. The level of cruelty really shocked him. Secondly, he hadn’t realised that the Nazis knew that their action in killing the Jews was a totally criminal activity, and that they had made so many efforts to hide and obliterate the evidence of these atrocities. He thought that they would cover this with ideology, but in fact it was clear they knew themselves to be practising criminality on a grand scale, a crime against humanity. Finally, the book reminded him about when he had first heard about the Holocaust, and the first book he read about it. He recognised one of the photos in my book, one of women prisoners running naked through a concentration camp, watched by uniformed SS guards. I’m sure many people must have a strong memory of when and where they first learned about this atrocity. I was quite young, maybe 5 or 6, when I became aware that ‘Hitler killed 6 million Jews’. How he killed them I did not know at the time, and the word Holocaust was not then in common use, although I was aware that there had been concentrations camp where Jews were gassed to death. I learned today that my audio of I Survived a Secret Nazi Extermination Camp is now online at Audible.com. It’s taken quite a long time to get the audio uploaded and the reasons are many. In the beginning I decided to call the audio (and book) Testament, and I prepared artwork and recorded the audio with that title. However my book publisher- the inestimable David Cohen of Psychology News Press – thought that Testament was not a strong enough title. I agreed, and went in to the studio to record the new title- I Survived a Nazi Death Camp. When it came time to look at possible covers for the book, I went to Hatchards bookstore in London to look at their history section. My friend Ruth came with me to help.After looking at some of the books on display, she suggested that even my new title wasn’t strong enough to lift my book out of the huge mass of WW2 books published every year. Her proposed solution – rewrite the title as I Survived A Secret Nazi Extermination Camp. I agreed with her for two reasons. Firstly, the camp in question – Belzec – was a secret camp, both for the Nazis who wanted to keep its existence unknown to the outside world, and it is still unknown today, unlike the sister camps of Treblinka and Sobibor, which many people have heard of. The reason Belzec is still so little known is that there was only one survivor of that death factory – Rudolf Reder- and it is his story that forms the basis of the audio. And it was an extermination camp, not a death camp. In the Nazi concentration camps death was a constant, but it was in the extermination camps of Belzec, Sobibor and Treblinka that the Nazis put into effect the industrial killing of Europe’s Jewish population. Victims arriving at these camps by train survived for no longer than 2 hours before being inhumanly gassed. So having made the last title decision, I went back to the studio at Heavy Entertainment and re-recorded the new title. Now I am waiting for the book to be printed and we will be able to launch it with our non-existent publicity budget. Still, I am proud of the book and audio, and I believe it is not only a good book, but one which has an original take on the holocaust. Really, I wrote the book for my grandfather, and since he died in the 1970s other people will have to read it and listen to the audio to bring the story to life.